Guest List - There are two considerations when planning your guest list, your space and who to invite. An ideal setting is for guests to have ample room to be seated and within easy reach of the food selections. For smaller, more intimate gatherings of 6-8 people I like to use my living room and I put a lazy susan on the coffee table for food. For larger groups, of up to 12 friends, the dining room table is perfect and food items can go along the center. The guest list should include friends that drink and enjoy wine and people who are interested in trying new things. They will truly appreciate and enjoy the experience! When it comes time to invite them a personal phone call is a nice touch. Wine Selections - When planning your wine selections I recommend 5-6 different wines with an even mix of whites and reds. For one of the whites, I like to serve a sparkling wine, as guests arrive, so they can enjoy a glass while they mix and mingle. 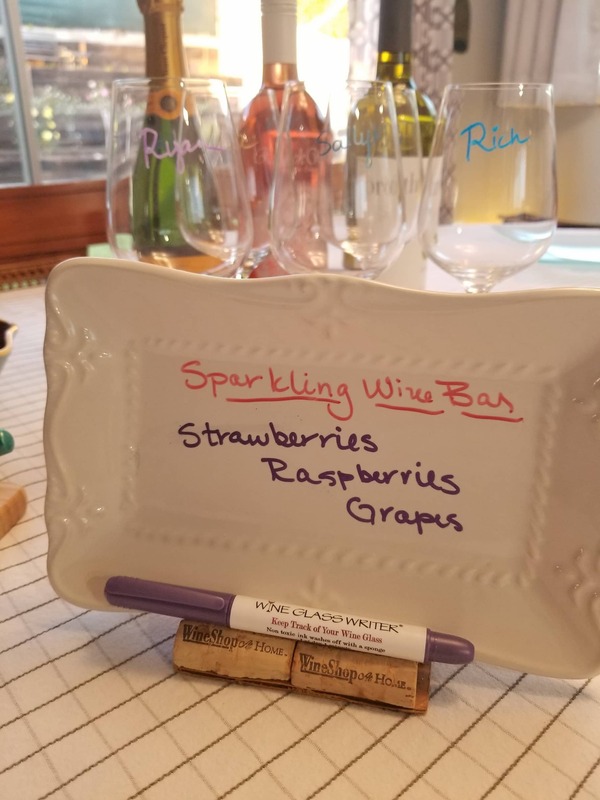 Set-up a sparkling wine bar, with a selection of grapes, strawberries, and raspberries, so guests can add a few to their glass. Once seated start with the lightest white and move through to the biggest red. You might want to enlist the help of your friendly wine steward at your local wine store or your grocery store. They can provide you wine recommendations as well as a little information about the wines that can be useful during the tasting. Wine Quantity - As far as quantities I would suggest 2 bottles of each wine. The recommendation is to do a 2 oz. pour of each wine being tasted so you will get approximately 12 servings per bottle. Having an extra bottle will give your guests the opportunity to “revisit” a wine at the end of the tasting with a full pour. Chill the white wines (3-4 hours in advance) and ensure the reds are kept in a cool place. About 15 minutes before the tasting open the red wines so they have time to breath. Number your bottles with a wine glass writer, in the order they should be served, so you remember as you go through your tasting. 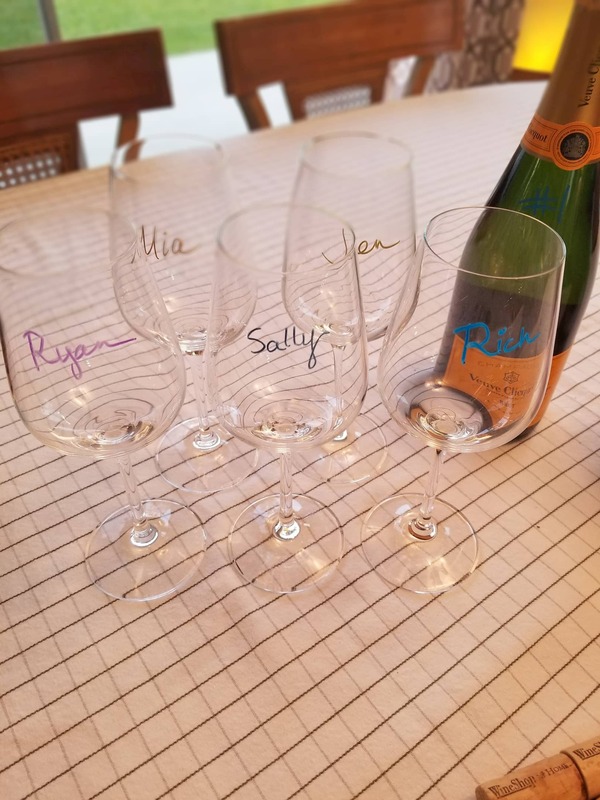 Write guests names on the glasses or leave wine glass writers near the glasses and let guests decorate their own glass. Prepare your food items and use wine glass writers to mark your cheese selections on your platters, plates or ceramic placeholders. Prepare items for your sparkling wine bar. Time to Taste - If you want to be a little more formal with your tasting, use this tasting guide and have guests take notes about the wines. If you prefer to be more casual just talk through each one as you go. Start with your lightest white wine and pour approximately 2 ounces in each glass. The key to tasting is incorporating the 4 S’s - see, swirl, smell, sip. See to note the color, Swirl to open the wine up, Smell to get an idea of what’s in the glass and Sip, it takes 2-3 sips to really get the true flavors. As you go through the wines suggest guests taste some of the food selections to see how it works with each wine. Typically the fruit and milder cheeses work best with the whites while the medium and stronger cheeses work with the reds. At the end of the tasting offer guests a glass of one of their favorite wines. So next time you are looking for a fun and unique way to get together with friends try bringing the winery home by hosting your own wine tasting.